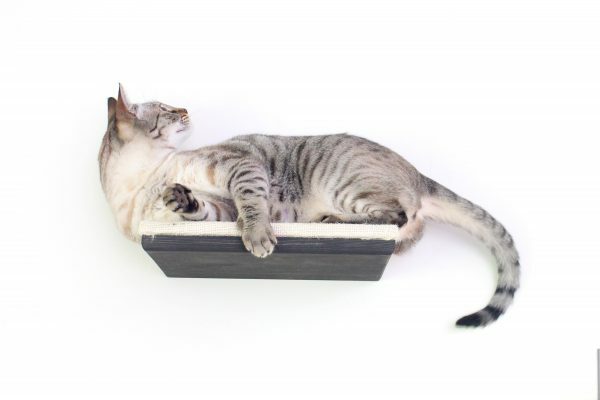 This shelf is primarily for use as a stepping stone. 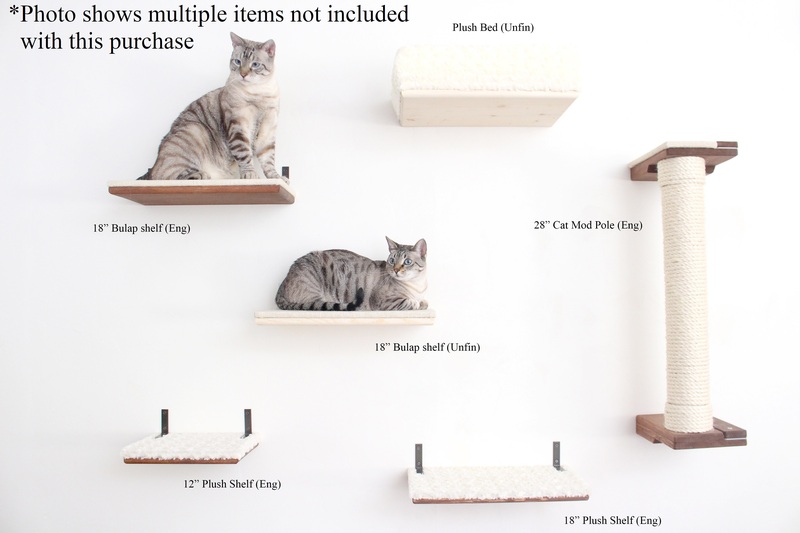 It’s not quite large enough for most cats to lay on but is the perfect size for hopping to another shelf. The top of each shelf has multiple layers of fabric. 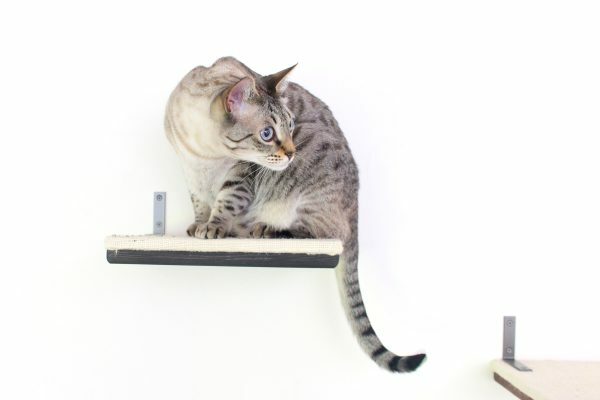 Our cats can climb on them and jump around the wall with ease. Our cats love the rougher feel of the burlap fabric with which they use to scratch their faces. 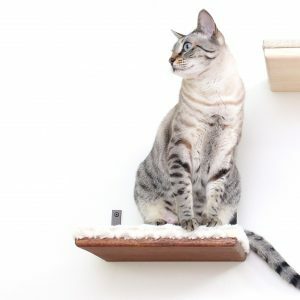 Beware: Your cats may fly across the room to jump onto these but the burlap’s amazing grip will allow them to pull themselves right up onto the shelves. 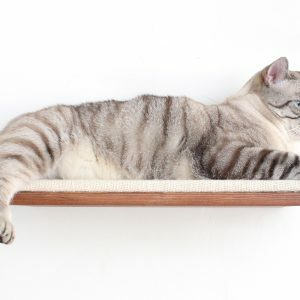 1 (one) 12″ Cat Shelf Covered with Natural Burlap fabric. 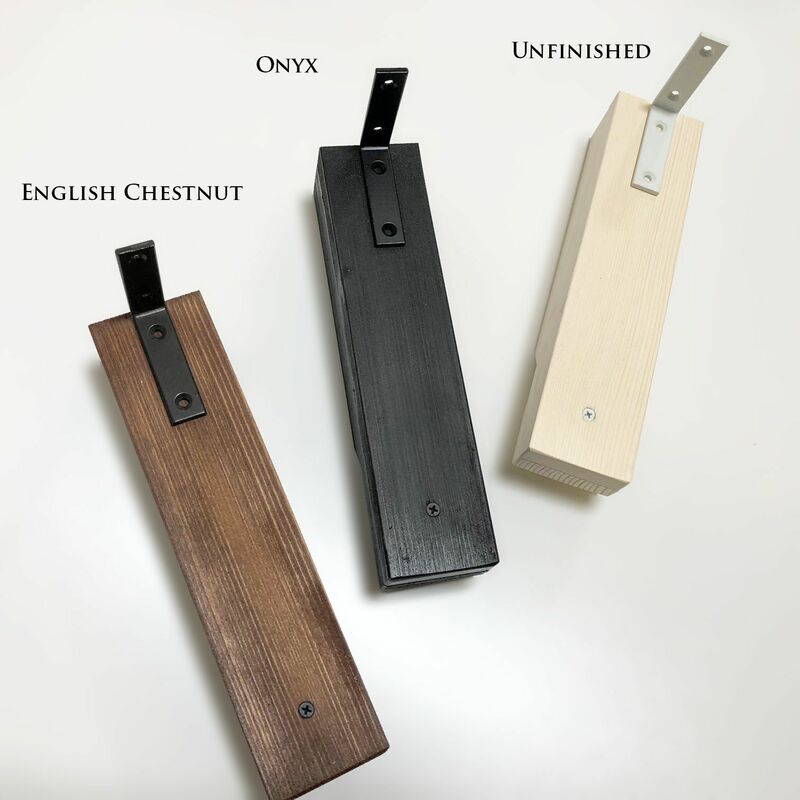 These shelves come with two brackets attached to them, with one bracket meant to be mounted into a stud and the other to be mounted into drywall with anchors. All of our furniture also comes with screws and drywall anchors. 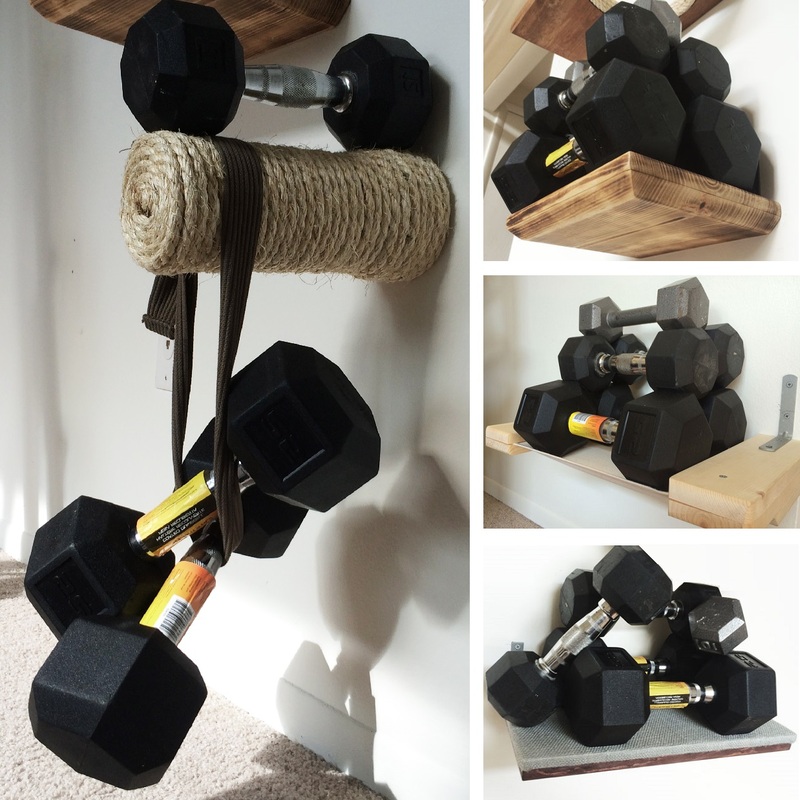 When mounted into a stud, these shelves are very sturdy and have been tested to hold 85 pounds. A small step they jump to to get them to sisal post steps.. they love it and scratch on the material! The review should be written by the cats, as they are the users... 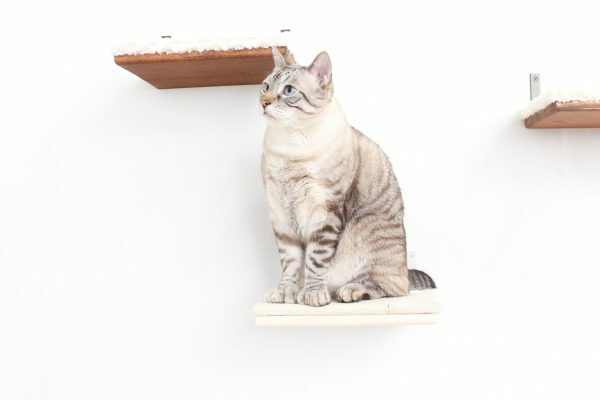 They both immediately took to the shelves and seem to be enjoying the view they get from up there. One of them is also using the burlap cover as a scratching surface! Phoebe loves her new shelves!! 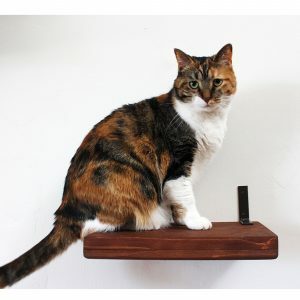 "Phoebe loves her new shelves!! I've purchased a number of items from Catastrophic Creations and will most certainly be back for more. Each item was exactly as described, packaged well and promptly delivered, and most importantly, serving as a continuous source of entertainment for my kitty. 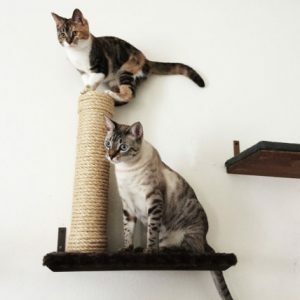 Additionally, the owners are super friendly and helpful, and are clearly cat lovers to the fullest extent. Phoebe and I couldn't be happier!!"